Hosts Kami Ahrens and TJ Smith take you on a journey through Southern Appalachia heritage using stories, songs, and more from the Foxfire archives. This pilot episode explores storytelling and the role of folklore in the mountains. Featuring storyteller and musician Stanley Hicks, we talk animals and legends and whether or not the ‘stinger snake’ really exists! Original cover for vinyl album “It Still Lives.” Cover image features Stanley Hicks during an interview. Stanley Hicks lived in Watauga County, North Carolina, near the Tennessee border. Primarily featured as a maker and player of the banjo, Stanley was also a great storyteller and verbal artist in his own right. 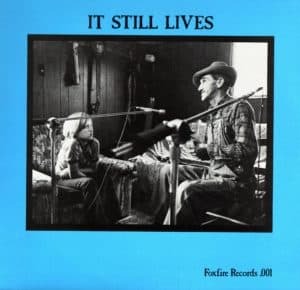 In 1980, Stanley, along with a handful of other traditional artists, was featured on Foxfire Records’ very first production, It Still Lives – a project that came about out of interviews students conducted for Foxfire 3’s section on the banjo and dulcimer. The main focus of the record was traditional string music played on those instruments, but Stanley’s incredible riddles and stories inspired the students and Foxfire music teacher George Reynolds to include a bit of his verbal artistry. Cotton: Have you killed any big rattlesnakes or something like that? Stanley: Rattlesnakes…Well, I’ll tell you now, I’m a goin’ to tell you this and it’s a fact, son. Ain’t no joke about this. Yeah, I’ve killed rattlesnakes – come pretty nigh gettin’…bit by one. But I killed a snake, I’d wished I put in alcohol and kept it. Now you’ns might not believe it but it’s the truth. I’m goin’ to tell you the facts. I stayed in Beech Creek. Years ago I stayed over there. I been here since ’52 (1952) and, uh, went on down, it’s been, I couldn’t tell you now. I’d say it’s been thirty-five years ago – thirty years, anyway, and they, uh, cradled oats and stuff, you know, back then they cradled oats and stuff. And they was a patch of oats where they’d cradled at and, uh, they was an old [place], where they’d stacked’em at and they tore this stack down. And the stubble, you know, was about this high and the grass was a comin’ up in it. And I went up there to get some of these old pieces of rails and stuff, you know, to clean it up off the ground, for a feller. And was aiming to take some of ‘em to the house for wood. I don’t know whether you ever heard tell of or not, but this was a stinger snake. And it had a stinger in its tail about this long [one inch], with a joint in it that was as hard as a bone. It come up and I got to fighting it and I fit it, and fit it, and fit it, and fit it. And its head was slick and it had hair, like you saw birds, it had hair on it about like these wooly worms not hardly that long. And I fit that snake for thirty minutes and I was give out. Sweat was rollin’ off of me. And every time I’d strike, it would disappear, you know, it’s just gone. I’d say I fit, anyway, a half hour. Finally I just happened to, happened a good lick and hit it right in back of the neck and knocked it and killed it. And it had a stinger in the end of its tail. Hoop snakes is what they called ‘em, you know, roll. You know, they call ‘em Hoop snakes. And that’s the only one I ever saw and I’ve heard Grandpa and them talk about ‘em. They roll this a way and when they get to you this stinger goes in you. And hit stand straight up on that, it’d stand straight up. I took it down to the road and hung it up in a bush. Tied a string around its neck and hung it up in a bush and it stayed there for two months. You know, till it just…And people came from everywhere’s to look at it. And it had hair – it was just a fine. Pretty coarse, but it wasn’t long, about this long. About, ah, I’d say about eighth of an inch. And the stinger in it’s tail had a, it had a joint in it, had a joint in that and it’s head was slick. And I’ve never seed one since and nobody else ain’t. And if I’d a took that snake and a put into the, you know, put it in alcohol or something, I could have been rich. Our intro music features Guy Carawan; our outro music is Leonard Glenn. Both recordings are property of Foxfire. Foxfire Podcasts? What a great project–the perfect way to share Foxfire’s extensive audio archive! Kudos, y’all! I’m 70 years old and my daddy was raised in Arkansas. He told me many times about snakes like that. He said that put their tail in their mouth and made a hoop.He said that they would roll toward you . He said that you could see a bone or stinger at the mid part of their tail. He said he didn’t know if they were poison or not as he had never known of anyone being “stung” by one.